Good wrist hinge during your backswing is essential element of club head speed. Golfers who want more distance know that increasing their club head speed is a good way to get it. Club head speed is measured at the point of impact. Many golfers try to swing faster throughout the swing and end up losing speed at impact. The most important factor is the release of the club at impact. Golfers with fast club head speed release the club later than those with slow club head speed. Proper grip, wrist hinge, body rotation and downswing are all necessary to release the club later and gain club head speed. Grip the club in the fingers of your left hand (for right-handed golfers). The "V" formed by your left thumb and index finger should point toward your right shoulder. Grip the club in the fingers of your right hand. The "V" formed by your right thumb and index finger also should point to your right shoulder. Relax your arms and hands for a light grip pressure. Swing the club back with your shoulders and restrict your hip turn. Hinge your wrists as your shoulders swing the club back. Stop hinging your wrists when you have a 90-degree angle from the club shaft and your left arm. Finish your shoulder turn with your left shoulder under your chin. Restrict your hips as you finish your shoulder turn to create coil in your body. This coil will help create club head speed on the downswing. Start your downswing by turning your hips to the target. 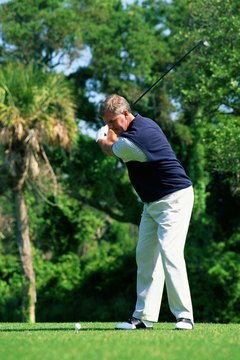 Keep your arms and hands relaxed as you swing down. With the proper grip and your hips turning to the target, the club will release later in the downswing. As your body starts to uncoil, the club will whip through impact at a high club head speed. Turn your hips 45 degrees to the target at impact for maximum power.